Parapet walls expand and contract at a greater rate than masonry because the parapet lacks the dead load of the masonry above to help contain movement. If this movement is not accommodated, displacement of the cap and cracks in the stucco can occur. The displacement of the cap and resulting cracks will create leakage issues that will cause deterioration of your walls. Adriatic Restoration’s highly skilled team will complete your parapet wall repairs in a timely manner and at a reasonable cost. A damaged parapet wall, parapet cap and coping stone causes water leakage through the openings in the wall. Coping stones replaced. 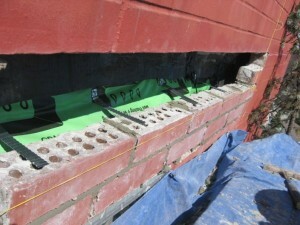 Adriatic has the team for the job and is eager to address all of your parapet flashing needs.